Balaclava ANN is conbination of two breathing materials. Thats why it’s give you good warm protection around your head and also trensport moistute very fast to outside shell. Material DRY on mouth and nose area, allow comfortably and easy breathe. 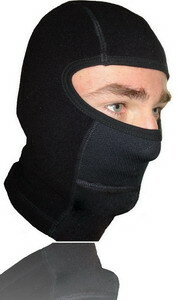 Even if you breathe is very fast (skiing, fast walking) your balaclava ist always dry. Protect your face extremely well and support unpressure building of helmets. Guarantee allso discretion persons who using them. Suitable for: wintersports (skiing, snowboarding, nordic walking, ect.) motorcyclist, army.... In all places where are bad and cold weathet conditions.